Interview with Ed Averett – The Man Who WAS the Odyssey² - The Odyssey² Homepage! Classic Gaming Expo has always been an amazing event that gives attendees the rare opportunity to meet and hear from the people responsible for video gaming's glory days. CGE 2014 was no exception. Saturday, Sept. 13 began with a presentation by the engineers who had created the Vectrex. Shortly after, the Blue Sky Rangers – the original Intellivision developers – gave a talk. At 5:00, a group of original Atari game designers held a panel discussion. Finally, a little after 6 p.m., about 15 minutes after the Atari guys had left the room, Ed Averett took the floor. His presentation, billed as "Magnavox Odyssey 2 Software History: The Good, The Bad & The Ugly," was the only time Averett had ever given a public talk on the Odyssey². As far as I know, it was the first time he had discussed the O2 at all since his Halcyon Days interview in the late 1990s. It was an extremely rare opportunity to ask questions of the man who developed half of the system's library, kept the machine alive, and basically WAS the Odyssey² for much of its early life. The complete audio of Averett's presentation is available here, and I urge all readers to listen to it. I was at CGE 2014 on Saturday, and had greatly enjoyed the Atari panel. But of course, I was really excited to finally hear from the man who had created so many of the games I grew up playing. I grabbed a seat at the front of the room shortly before Averett's talk was scheduled to begin. As I was waiting for him to arrive, I overheard a man in the row behind me talking to a younger O2 fan who was carrying a Conquest of the World set. That man was Ed Averett! Of course I couldn't let that opportunity pass by. I waited for their conversation to hit a lull – I still hope I wasn't interrupting – and introduced myself. I asked Ed if I could quickly interview him in the few minutes before his talk, and he graciously agreed. The transcript of our 15-minute conversation, lightly edited for clarity, is below. It ends a bit abruptly because it was time for the talk to begin. Remember that this interview occurred before the public panel. As it happened, some of my same questions were asked later by others, so if you've already listened to the panel you may see some repeated answers. Nevertheless there are some details in Ed's answers to my questions that didn't come up in the main panel. I'm still excited by this opportunity and very glad that Averett agreed to appear at CGE this year. So many of the details surrounding his time with Odyssey² are incredible, with 30 years of built-up rumors and misinformation surrounding them, that it was such a revelation to hear about what really happened back then from the person who knows it best. The fact that he was such a friendly, articulate and obviously smart guy was great too. Thanks again Ed, for your talk, your time, your Odyssey² work, and of course for giving the world K.C. Munchkin! William Cassidy (WC): The story that I've probably heard the most often, is that Magnavox and Philips wasn't really that solidly behind the Odyssey². Averett: (Laughs) That would be a giant understatement, from the very beginning. That's the only reason I got a shot. Averett: ...before it was born. Abort! Abort! Averett: Sam wasn't even on board then. Sam wasn't brought on until after the K.C. Munchkin thing, when they went, "Oh my gosh, this could work!" And then they said, well, let's go hire programmers since we're paying Ed all that stuff. So then they brought Sam in with his group. But until that point, they were, every month, "We're gonna kill it, we're gonna kill it." Which is why they let me do what I did, because after all, it wasn't important. WC: (Laughs) So all that stuff is true, then? 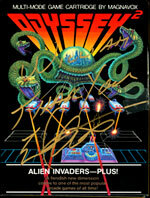 After his talk, Ed autographed my unopened copy of Alien Invaders—Plus! WC: Why did Magnavox go through building a system, but then pull all the support for it? Averett: I wanted to give a little shout-out for one person. I did a little research when I was preparing for this topic – I hadn't looked at it in 20 years, any of this stuff. Roberto Lenarducci was the engineer in charge of building Odyssey². He was the program hardware engineer. He built the keyboard, built all that – his team did. He was a brilliant young man. They did that, had a design, it worked perfectly. Breadboarded it up, what they wanted to do, did the plastic mold for it. I was at Intel. We decided we were going to sell the 8244 chip to Magnavox as opposed to Atari, because after all, it seemed like a no-brainer at the time. So, we sold that [to Magnavox], but then Intel had a bug in the system and it came out a year later. Atari took the ball and ran for a year. [Magnavox] knew they were taking over the market, and the Odyssey people said, "We're just going to run our inventory out. We've got 5,000 of these things in stock; we're just going to get rid of those and then we're just going to close it down." I went, "Wait, wait, wait! You just need more software!" And so that's how I got in the door – that's the short version. And they said OK. And they sold out. The first month it went out there: they sold out of everything they had, immediately! And they said, OK, one more month... but that's it. And it went on like that for two and a half years! Every time, it was, "OK, lights out as soon as we get the inventory cleared." Which drove Intel crazy, which drove all the engineers at Magnavox crazy, but it gave me an opportunity – which I greatly appreciate. WC: Your position was at Intel, right? WC: Did you actually become a Magnavox employee? Averett: No, never. I was strictly a royalty game programmer... because they wouldn't pay me, anyway. If I said, "Give me a job," they'd say, "No, we're shutting down. We're firing people; we're not hiring people." And I'd say, OK great. I didn't ask them for a job but I said, "Hey, how about a royalty? You don't have anything at risk; I have everything at risk. I believe in the system." Averett: It was wonderful. Well, I knew it was a winner. I mean, if you knew anything about what was going on – and I had a wonderful perch to look at the industry from where I was at Intel – I knew videogames were going to do what they did, and interactive graphics was going to do what it did. So it was a slam-dunk, as long as they didn't shut the door down before they got anything out of it. Fortunately, they didn't do that. Averett: Oh, it was crazy. It was crazy. The other person you should interview is Mike Staup, or Ann Staup. WC: Yes, I'd like to talk to him but I've never had the chance. Averett: He's back in Knoxville, I think, still. He's a good guy. He saw it, he understood it, but he couldn't convince upper management to do anything but build TVs. All the money that we made in the Odyssey went to the TV business. We built a beautiful building for them. 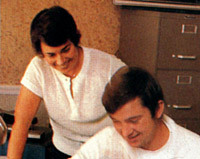 WC: One other story that I've heard is that your wife (Linda) was involved with designing some of the games. WC: Did she actually do some of the work? Averett: Yes, you know, she did some, but my wife is not a games programmer. She is a serious, operating systems-type person. But they weren't paying her enough at HP (Hewlitt-Packard). And so I came on board to hire her. I said I'll order-of-magnitude increase your salary – come work with me. And she said, (makes an incredulous noise). And yet that of couse was one of the more stupid things I ever did; never work with your wife. Averett: So we tried to find things she was really good at – and there are – but I absolutely guarantee I drove her crazy. Because my methodology for developing games is iteration: I have an idea in my head and then I iterate through it. I do not have a brain that can hold a massive amount of information, but I do have fun. So, when I see some of the games, I can go, "Oh, that's cool, that's cool..." Well, that's not the way her brain works. She wants everything together. And she's a hoopty-do at Microsoft now. WC: What's she do at Microsoft? Averett: She's a VP there. Everything she has touched there has been golden. She's sold billions of things that she has her stamp on. So I'm real proud of her. But games? Not her happy place. A big, massive operating system or something of that nature, a closed system: perfect. Nobody's better, absolutely nobody's better. WC: So, you were a programmer, she was a programmer, she did some of the programming? Averett: She was a programmer; I wasn't a programmer. My background was electronic engineering. I did FORTRAN in college with punch cards. So I had to teach myself Assembly language. I knew how smart she was, and I knew if I could tap into that brain power, it'd be fantastic! I tapped it a little bit, but – this was all my fault – my skill set was not comparable, or complimentary to her skill set, which is outstanding. WC: So was your design process: you'd come up with a game idea, maybe bang out some code yourself, or take it to her...? Averett: More to the idea: Mike (Staup) would do it. [Note: Mike Staup was the Magnavox VP in charge of games.] So I'd say, OK Mike, what market do we want to approach? And one of the things he was hearing initially was education, everybody wants education. OK, so we did Take the Money and Run, which is a little bit educational, but it had bad sales. Interesting technology but bad sales. And we said, OK well, what's going on here? The kids make the decision, not the mothers – we learned that. And so we said, OK, let's address the children and the people that are using it. And Mike was saying, do this, do this... in terms of the target market that we were after. And then I would come up with a game, because I knew the chip backwards and forwards. That was what I did at Intel. I didn't do the hardware, I did the program management. WC: So you'd come up with ideas. Was it primarily you and Mike working together? Averett: No, he would say, I want to address this market. And I'd say, OK, I'll come back in two months and I'll show you a game. He said, OK fine. And that was the beauty of the royalty rig, you know, because if I failed, I failed. It was all on me. I'd go away and work in my little [programming shop at home]. WC: From what I understand, you succeeded most of the time. I've heard that most of your games sold out. Averett: I think all of them always did. I don't think there was ever any that got buried or anything like that. That was very fortuitous. See they didn't make that many, so it was always that supply was limited. WC: In probably about a 1982 timeframe or so, it seems like Magnavox finally started to realize that they may have had a system that could move some units on their hands. Averett: K.C. opened their eyes. WC: K.C. was your idea? Averett: Oh, no. Pac-Man of course was the big hit of the time. Magnavox marketing said, can you do a [Pac-Man] type of game? Of course we can. They said, OK, come up with some concepts and run it by us. And I came up with some prototypes that were actually a lot further away than what actually was produced. They said, no, no, that's too far away. We want the "look and feel" of Pac-Man. And I went, really? OK. And so we shifted back to more of the look and feel, which, as you know, down the road, got us in big trouble. WC: That's one thing I was going to ask you. As you were building it, did you have any kind of inkling that this was going to cause trouble? Averett: No, none whatsoever. Because at that time, all copyright law was: are you copying something, was I copying code? I never saw the code. It was a totally different instruction set. It wouldn't have mattered if I had seen it; it wouldn't have made any sense to me. So nothing was copied except the look and feel. But I got to add to it. I said, OK guys, can I improve on it? They said yes, you can improve all you want to, but we want everybody to kind of think it's similar to Pac-Man. I said, OK, all right, we can do that. WC: Did you get called in to court, to testify? Averett: Oh, yes! On every continent. (Laughs) And that was really a good, fun experience. I learned a lot. WC: (Laughs) I don't think I've ever met anyone else that would describe going to court as a fun experience. Averett: Well... I was learning copyright law for stuff that had never been decided. I mean, this was the, as you know, the landmark ruling for how games could be, or could not be, copyrighted – the look and feel, which had never been done before. And I would question that; I think the look and feel of K.C. was actually quite different from Pac-Man, but we never introduced that into the court record. Because the laywers at the time for Magnavox said, don't say anything you don't have to. If they don't ask it, don't say it. And we're going to put as little information in the court record as possible. And so the Atari lawyers came back and just ignored all the court records that we had and said, look at the look and feel, that's what we're talking about! WC: Do you think that's why you lost on appeal? Averett: Oh, yeah, that's what they said. WC: There is a famous game called "Pink Panther" – based on the cartoon character, which was right at the tail end of the Odyssey's existence at Magnavox, and I've heard rumors that you worked on it, for the Odyssey²? Averett: No, that was Sam's. WC: Sam worked on that? Averett: Yes. My last one was "Timelords." WC: Attack of the Timelord? WC: Is K.C. Munchkin your favorite game? Averett: One of them. He will be back. K.C. 's returning. WC: Is there anything more you can share about that? WC: So that means you still have the rights to his name? WC: And the character? Excellent. Averett: Which is why I did K.C. 's Krazy Chase, because there's been some talk about why I did Krazy. I wanted to make sure I had the rights to the image and the name after the lawsuit, and that it wouldn't be challenged. Because at some point down the road, I wanted to bring back the features that I thought everybody missed – and they still miss – about K.C. Averett: The timing's right. And there's critical things in place. Thank you Steve Jobs, we have app stores. Independent people can design games, put it up there on the Web, and if it's good, and people will pay for it without worrying about getting ripped off. The Web, as we all know, is the Wild, Wild West now. If you're an independent game designer and say, "Oh, I've got a brilliant game," people would be crazy to go to your Web site and put their credit card in. So that happened, we have app stores. My people are all in happy places now. My kids are in a happy place, my wife's in a happy place. And they're all at Microsoft. And Microsoft has a store, so I can do a win-win-win. K.C. is going to return, soon. Most likely by Christmas on the Microsoft Store.